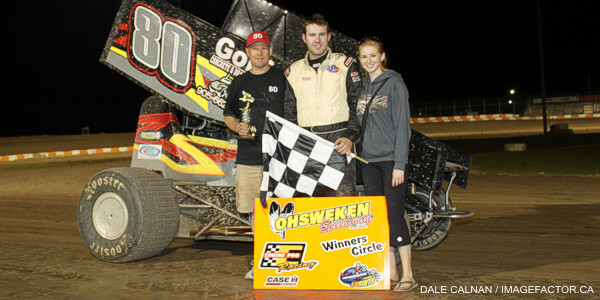 By Tommy Goudge (May 25, 2012) – Glenn Styres, Paul Klager, Brad Herron, Jason Lungaro, and Max Chechalk opened the 2012 season for Friday Night Thunder at Ohsweken Speedway where they wanted to be – the Engine Pro Racing Winner’s Circle. Great weather and large car counts greeted the enthusiastic crowd, as Engler Machine & Tool presented the 17th annual Season Opener at Ohsweken, featuring the Corr/Pak Merchandising Sprint Cars, Modified Lite Stars International Championship Tour, Lighthouse Tattoos Thunder Stocks, HRW Automotive Mini Stocks, and Pierced Parks Bombers. Chris Jones and Todd Hoddick made up the front row for the first Sprint Car feature of the season, and Hoddick took off at the start. The New Yorker led the first 9 laps before giving way to Michigan driver Dain Naida. It looked like Naida was on his way to the feature win, but Glenn Styres had other ideas, and was looking to make his move when the race’s only caution flag waved for a spin by Havard Daniels on lap 20. Naida protected the top groove as best he could and held Styres at bay for a couple of circuits, but Styres was able to get by on lap 23 to took the win. 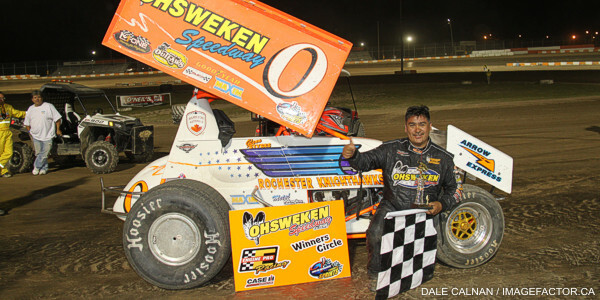 The win was Styres’ 4th career win in a season-opening Sprint Car event at Ohsweken. Naida settled for the runner-up spot, followed by row 5 starters Chris Steele and Jamie Collard, and Tom Huppunen rounded out the top 5. Heat races for the 30 car field were claimed by Tom Huppunen, Jared Zimbardi, Jamie Collard, and Glenn Styres, while Dave Dykstra won the B-Main. Derek Wagner led the first lap of the Mod-Lite feature before Josh Sliter took over and led the next 10 before his uncle Shawn got by. Shawn led the next 4 laps, but Paul Klager worked his way through the field from 10th on the grid, and made the winning move with 4 laps to go. Shawn Sliter settled for 2nd, followed by Jeff May, Jason Corless, and Kory Howe. Heat races for the 16 car field went to Derek Wagner and Shawn Sliter. Terry Martin and Lee Winger were on the front row for the Thunder Stock opener, and Winger opened a lead Brad Herron quicky moved from 6th on the grid to 2nd, and begin to chase Winger down. Herron made his move in the middle groove, and set sail out front. Neither slower traffic or a late-race caution flag could keep Herron from claiming the win. Cory Turner moved up from row 5 to take 2nd, followed by Winger, Jack Myers, and defending champ Mike Thorne. Heat races for the 31 car field went to Jack Myers, Terry Martin, and Lee Winger, while Kameron Kocarik claimed the B-Main. Jeremy Hughes started the Mini Stock feature in the pole position, with Brittani Myers on the outside of the front row. Hughes got the early jump and looked to be the driver to beat, but Jason Lungaro patiently picked his way through the field from 8th on the grid to challenge for the win. Hughes was in the lead with the white flag in the air, but Lungaro made an outside move and won the drag race to the checkered flag for his first career feature win at Ohsweken. Hughes settled for 2nd, followed by Mike Evers, Steve Miller, and Brittani Myers. Heat races for the 25 car field were claimed by Jeremy Hughes, Mike Evers, and Laura Hughes. Max Chechalk and Glen Hils began the Bomber feature on the front row, and Chechalk took a lead he would never relinquish. 2011 title contenders Jesse McDonald and Rodney Rutherford moved up from row 4, but they couldn’t catch Chechalk, or eventual runner-up Davey Boughton. 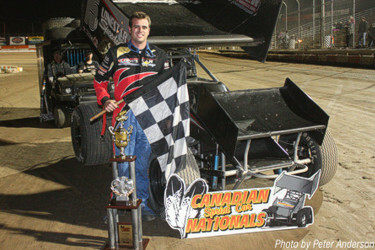 Chechalk won the first feature of his career, while Boughton took 2nd, followed by Rutherford, McDonald, and Dusty DeBoer. Heat races for the 16 car field were claimed by Jesse McDonald and Davey Boughton. Grisdale Racing presents “Sponsors Night” next Friday, June 1. Corr/Pak Merchandising Sprints, Lighthouse Tattoos Thunder Stocks, HRW Automotive Mini Stocks, and Pierced Parts Bombers are all part of round 2 of Friday Night Thunder, along with the first visit of the season by the Vintage Cars. Gates open at 6:00 with racing starting at 7:45! 1. Tom Huppunen (Fenwick), 2. 67 Chris Durand (Port Stanley), 3. 10c Bob Crawford (Sutton), 4. 9nz Havard Daniels (Coatesville, NZ), 5. 5c Conor Mahoney (Waterdown), 6. 3r Shane Ross (Thedford), 7. 94 Stan Zanchin (Fort Erie), 8. 31 John Burbridge, Jr. (St. Williams) DNF. No Time. 1. 35 Jared Zimbardi (Salamanca, NY), 2. 14h Jim Huppunen (Fenwick), 3. 80 Chris Steele (Vineland), 4. 10 Mitch Brown (Brantford), 5. 5m Brad Malloy (Niagara Falls), 6. 30g Steve Goldner (Aylmer), 7. 81 Derek Jonathan (Lewiston, NY). No Time. 1. 7x Jamie Collard (Burford), 2. 07x Dain Naida (Tecumseh, MI), 3. 01 Mikey Kruchka (Hamilton), 4. 5d Dave Dykstra (Port Colborne), 5. 71 Travis Cunningham (Grimsby), 6. 11z Zach Zumpe (St. Catharines), 7. 90 James Evans (Beamsville) DNS. Time – No Time. 1. 0 Glenn Styres (Ohsweken), 2. 49 Todd Hoddick (Cheektowaga, NY), 3. 5 Keith Dempster (Alton), 4. 11j Chris Jones (Demorestville), 5. 84 Tyler Rand (Consecon), 6. 21j John Burbridge, Sr. (Simcoe), 7. 43 Scott Sherk (Port Colborne), 8. 52 Jesse Costa (St. Thomas) DNS. No Time. 1. 5d Dave Dykstra, 2. 14h Jim Huppunen, 3. 9nz Havard Daniels, 4. 71 Travis Cunningham, 5. 3r Shane Ross, /6. 5m Brad Malloy, 7. 94 Stan Zanchin, 8. 30g Steve Goldner, 9. 11z Zach Zumpe, 10. 21j John Burbridge, Sr., 11. 43 Scott Sherk, 12. 31 John Burbridge, Jr. DNS, 13. 52 Jesse Costa DNS, 14. 90 James Evans DNS, 15. 81 Derek Jonathan DNS. No Time. 1. 61 Derek Wagner (Middleport, NY), 2. 17 Josh Sliter (Ridgeway), 3. 7s Dillan Sliter (Port Colborne), 4. 77 Randy Hollingshead (Stoney Creek), 5. 26 Ray Sliter, Jr. (Ridgeway), 6. 27s Rick Koabel (Port Colborne), 7. 39 Dan Kviring (Brantford), 8. 2ez Blair Young (Niagara Falls). Time – 2:35.291. 1. 71s Shawn Sliter (Port Colborne), 2. 19 Jason Corless (Bolton), 3. 1 Paul Klager (Beamsville), 4. 33 Kory Howe (St. Catharines), 5. 16 Rob Goulding (Port Colborne), 6. 23 Jeff May (Mount Hope), 7. 9 Jared Turnbull (Paris) DNF. Time – 2:34.675. 1. 33m Jack Myers (Wainfleet), 2. 33t Cory Turner (Caistor Centre), 3. 12 Brad Herron (Brantford), 4. 73 Dave Bailey (Hagersville), 5. 11r Bryce Richardson (Port Colborne), 6. 62 Brian Pescetti (Stoney Creek), 7. 24k Kyle Magrin (Hamilton), 8. 00 Robbie General (Ohsweken), 9. 28 Jim Lampman (Caistor Centre), 10. 29 Adam Gracey (Dunnville). 1. 38 Terry Martin (Ohsweken), 2. 1 Chris Dickie (Brantford), 3. 17 Rob Disher (Grimsby), 4. 40 Terry Osmond (Cambridge), 5. 48 Mike Graham (Caledonia), 6. 57 Murray Nicholls (Hamilton), 7. 04b Rick Book (Stoney Creek), 8. 13 Kacey Huffman (Hamilton), 9. 4 Chris Gyokery (Jarvis), 10. 3b Blaine Barrow (Welland) DNS. 1. 2 Lee Winger (Caledonia), 2. 55 Mike Thorne (Caledonia), 3. 5h Devin Habiuk (Port Robinson), 4. 10 Jake Brown (Brantford), 5. 91 Ryan Turner (Caistor Centre), 6. 04 Wyatt Van Wart (Cambridge), 7. 333 Kameron Kocarik (Fonthill), 8. 68 Aaron Turkey (Ohsweken), 9. 00x Derek Miller (Ohsweken), 10. 191 Gord Bates (Selkirk), 11. 84rk Ryan Beagle (Vittoria) DNS. 1. 333 Kameron Kocarik, 2. 00 Robbie General, 3. 191 Gord Bates, 4. 04b Rick Book, 5. 29 Adam Gracey, 6. 13 Kacey Huffman, /7. 28 Jim Lampman, 8. 3b Blaine Barrow, 9. 68 Aaron Turkey, 10. 24k Kyle Magrin DNF, 11. 4 Chris Gyokery DNF, 12. 00x Derek Miller DNS, 13. 84rk Ryan Beagle DNS. 24. 00 Robbie General (20) DNS. 1. 10j Jeremy Hughes (Burlington), 2. 7x Chase Hess (Ohsweken), 3. 81 Karl Sault (Dundas), 4. 96 Brian Crosgrove (Hamilton), 5. 05 Dave Goodacre (Brantford), 6. 77x Ethan Martin (Ohsweken), 7. 38 John Cote (Hamilton), 8. 84 Dale Gyokery (Jarvis) DNF, 9. 69e Dan Erskine (Caistor Centre) DNF. 1. 265 Mike Evers (Caledonia), 2. 22 Brittani Myers (Hamilton), 3. 7 Jason Lungaro (Hamilton), 4. 99 Robin Elliott (Woodstock), 5. 79 Steve Miller (Paris), 6. 53 Sarah Rutherford (Dundas), 7. 27 Dan Stewart (Hamilton), 8. 55 Rob Slater (Dundas). 1. 10 Laura Hughes (Flamboro), 2. 64 Doug Erskine (Hamilton), 3. 66 Brandon Janssens (Woodstock), 4. 52 Kevin Ross (Mount Hope), 5. 11 Mike Giberson (Caledonia), 6. 69 Rob Twitchett (Dundas), 7. 02 Mark Czuba (Burlington) DNF, 8. 777x Steve Hess (Ohsweken). 1. 88 Jesse McDonald (Caledonia), 2. 23 Dusty DeBoer (Hagersville), 3. 97 Max Chechalk (Hamilton), 4. 16x Dwight Strauss (Ohsweken), 5. 007 Ian Myerscough (Burlington), 6. 66 Brady Longboat (Ohsweken), 7. 44 Tylor Brock (Dunnville), 8. 16 Jeremy May (Hamilton). 1. 18x Davey Boughton (Carlisle), 2. 81 Glen Hils (Dundas), 3. 38 Rodney Rutherford (Waterdown), 4. 21 Mark Bazuin (Caledonia), 5. 199 Frank Turkey (Ohsweken), 6. 707 Danny Shantz, 7. 03d Dakota Potts (Waterford) DNF, 8. 5 Kathi Dickie (Brantford) DNF. 16. 5 Kathi Dickie (16) DNS.